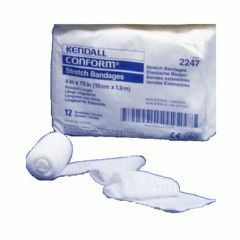 Conform Stretch Bandage, 2" x 75"
CONFORM Stretch Bandages provide softness, low lint, and high absorbency with moderate stretch for maximum clinical flexibility. Made from a cotton/polyester crocheted blend. Cotton/Polyester Construction - Provides elasticity allows it to retain its shape, reducing slippage. Allows absorption of drainage while remaining strong and durable. How are CONFORM™ Stretches commonly used? - CONFORM™ Stretch Bandages are commonly used as a securement layer. To Protect, Absorb, Secure and Support. What is the benefit to CONFORM™? - CONFORM™ Stretch Bandages are designed to stretch and conform, making them ideal for lower limbs and joints. They have a low profile which helps ensure patient dignity. Hi Craig, You know, I've been in the public sector for 30 years (fire), and served the community as my customer for all of that time. So... I can recognize excellent customer service when I experience it... just did... I got home from work last night to find the rollator that I bought my mom for xmas sitting in my front hallway. I just ordered it the day before!!!! Now, true I only live 150 miles away, but still!!!! That's really GOOD service. That coupled with your efforts to support the sale with your e mail... tops!!! Rest assured, I will continue to purchase items from your fine establishment. Have a very merry Christmas! !